A short history of William Odgers VC and his family. This tale is of life in the 'Waterside', Saltash, and at sea in the Royal Navy, during the mid-Victorian period. The lives of ordinary folk were hard and perilous and I dedicate this story to all those heroes. 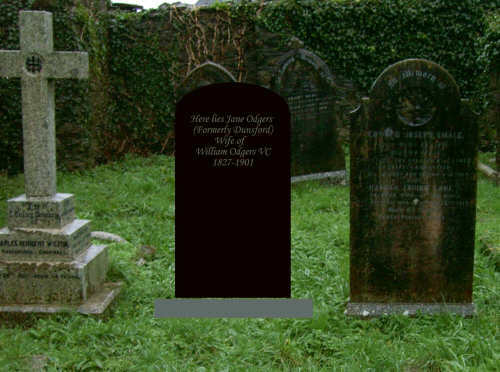 This blog features William Odgers VC* (an asterisk indicates the presence of an appropriate figure), his family, and their various interactions with the Dunsford family of the Waterside, Saltash. My great-great-grandmother, Jane Dunsford, was William's second wife who raised his son George (from his first marriage) from the age of two, after William's first wife, Ann, died. She also raised two children of her own, Adelaide and John, and later, after her friend Ann's death, her other, older boy, William. Neither Adelaide nor John were her husband Isaac's children. It appears that he effectively abandoned Jane after some time at sea, and soon after the birth of Adelaide he cut her out of his will in favour of his sister. It is, of course, known within the family that Adelaide was Odgers' child, conceived when he was barely sixteen. My mother's brothers, were raised with the help of George Odgers and his wife, Jane (called 'Aunt Jane'), when their own mother, Elizabeth Craven, nee Blackmore, died at the age of 40 in 1911. Aunt Jane was Elizabeth's half-sister. My mother and her sister were raised by Adelaide. To help the reader, the bare branches of the family tree are shown in a figure*. Some of the apparent complexity of the above relationships will be alleviated as we progress through the narrative. Included in the story are descriptions of the old Waterside, Saltash, where most of the non-naval action takes place, and potted histories of all the characters involved with some family photographs including those of the Odgers and 'The Patriarch' of Tamar street, Old John Dunsford. Some glimpses of life in the mid-Victorian Waterside that the reader will find interesting are added for colour.Because of his fame, William may be considered the central character of the story, which includes some details of his life, and his children, that have not been previously told. However, as we progress we shall see that there are more heroes within this tale, and not all of them have medals.For the first time, I shall describe at some length, the naval careers of William himself, Isaac Stoddon, Jane's first husband, and John Dunsford jnr, Jane's brother and Isaac's brother-in-law. I was only able to write this saga because I had the vivid memories of my Aunt Jose to rely on until she passed away aged 101 in 2007. 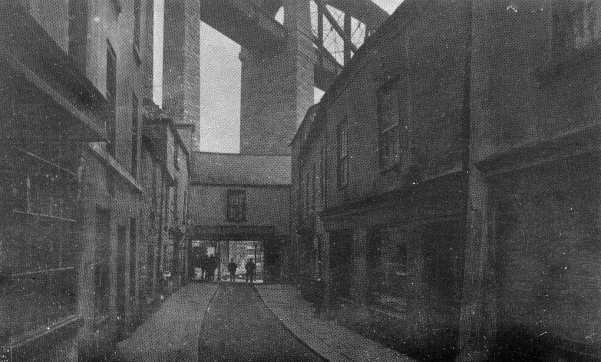 Her family*, her grandparents and her mother-to-be, Edith Trenouth, also lived in Tamar Street in the period of interest, but their dwelling was the other side of the Passage Arch, in the Ashtor restaurant and coffee house*. It might as well have been on another planet. In 1871 there were 370 people living in the Waterside defined by Tamar St., the Beach, The Battery and the Town Quay; 142 of these were children of 14 years or less. There were 42 dwellings, which means an average of almost 9 per house. In two of the larger houses, numbers 28 and 29 Tamar St. there were 25 and 35 inhabitants (yes 35), respectively. In winter the houses would have been cold, damp and malodorous. A variety of skills were shown by the adults. Fishermen, and fisherwomen, watermen, boat builders, fish dealers, and shellfish sellers were present in numbers, but there were also shopkeepers, carpenters, and most usefully, market gardeners, traders and a baker's delivery boy. This suggests that the food supply would be at least adequate and, moreover, nutritious, with plenty of fish, bread and some fresh vegetables. Not surprisingly there were a few retired seamen about, living mostly on pensions. Odgers was one, and Isaac Stoddon another, who, although living in Fore St., would have spent much of his time on shore in Tamar St. with relatives and friends. These sailors and their tales would have been the radio and TV of the age. The downside to living in these overcrowded conditions was of course the lack of hygiene and the absence of medical care. The disposal of human waste was an immense problem, compounded by the difficulty of obtaining fresh, unpolluted water. Toilets, in the most favoured households, would have been a hole outside the back door, washed down with a pail of water. In those not so fortunate it was a backyard midden, crude privy or cesspit; not always in their own backyard either. Water would have to be brought by the bucketful, usually by the children, from a standpipe or spring and stored in a tank of some description in the house. Tea was the healthiest option for refreshment. In those houses with many more people in, the nighttime arrangements for toilet do not bear thinking about, but would involve a slop bucket or two. For those of us raised in the aftermath of the Attlee Government, with a NHS, free education, University grants, flushing toilets and showers, it is necessary to put these conditions in context. Louis Pasteur did not publish his theory of germs until 1861. Even then, educated people, and even large numbers of scientists, did not believe it. Poor working class people would simply not have been able to make the abstract association between the invisible bug and the terrible illness for very many more years. To these folk in the Waterside, visiting the midden and then eating your supper would have been part of their routine. If one was lucky enough to survive into teenage years, the great killer TB was waiting. Responsible for about 15% of all deaths in this period, the biggest single cause, it accounted for half of the deaths of young women. It was a terrible death, generally taking between a few months to a few years to finish the sufferer, with an extensive range of symptoms including coughing blood to the point of exhaustion. It took William Odgers at 39, John Dunsford at 34, and Isaac Stoddon at 52. The Stoddon family headstone* from the beautiful St Stephens churchyard is shown to illustrate the mortalities. 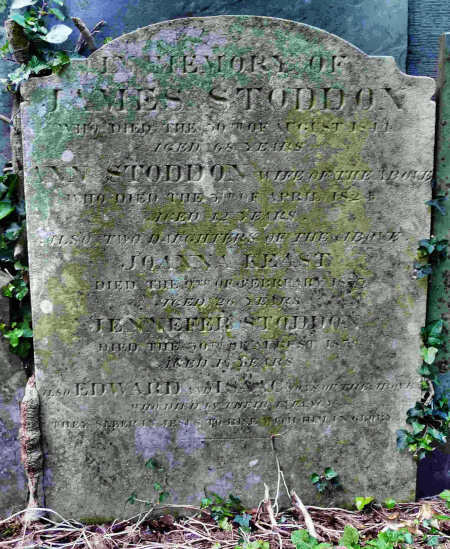 The death of James Stoddon, Isaac's father, is remembered, together with his wife, Ann, who died giving birth to Isaac (she had had a previous child also called Isaac who died in infancy) at the age of 42, two daughters aged 26 and 18 and two infants. James also had a son, John, who died as a result of an accident at sea age 33. A stroll around St Stephens churchyard will show you many similar stones, where only the names have been changed. Let us not forget, however, that there were plenty of sunny days in the Waterside, and on these days the place itself would look handsome, with river, beach, and even Tamar St., resplendent. There were still large numbers of children around, a triumph of the human spirit over the attrition of disease, and the street, beach, and river would have been their playgrounds, and filled with their laughter. This story really starts around 1800 with the birth of a man called John Dunsford. Astonishingly, he was to live to the age of 90 and live his whole life in the 'Alley'. He was a foremost 'Watersider'. Throughout his life he was a waterman, fisherman and Master oyster dredger. He married Elizabeth, called Betsy, and by 1840 they had three children, Jane, John jnr and Jessie. Their 'neighbour' at that time was a man called James Stodd0n, who lived with his daughter, Charity, and granddaughter, Jenefer (sic). James' wife, Ann, had died in 1824 giving birth to a son, Isaac, who joined the Royal Navy at age 13 in 1837. James had another, older, son, John, who was also in the Navy. 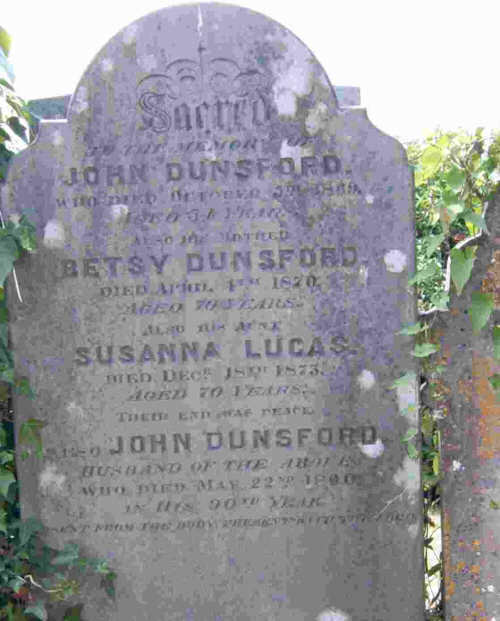 John Dunsford's elder daughter, Jane, married Isaac in 1846 in Stoke Damerel church just across the Tamar from Saltash. In 1851 Jane gave birth to a daughter Adelaide, who was to become the lady standing by the cockle stall*. 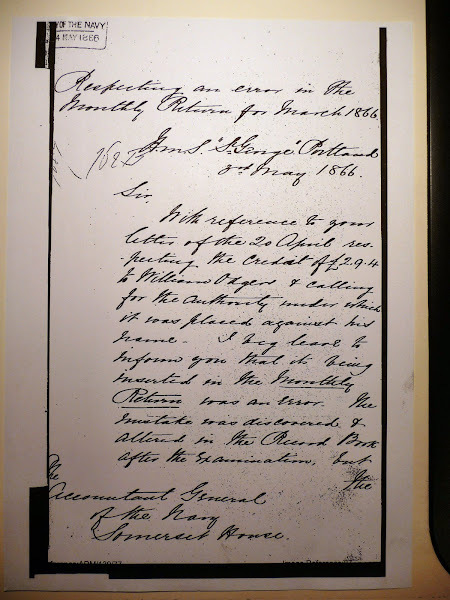 Isaac was not the father of Adelaide and in December of 1851 he changed his will in his sister's favour. Jane and her daughter left Tamar Street during this period, when her husband was still at sea, and moved to the nearby Beach until the early 1860's. Jane continued to use the name Stoddon for herself and her child during this period. By this time her father, who was still living at the same house in Tamar St. had become a Master dredger, employing a gang of 9. His wife and his other daughter, Jessie, were oyster dealers. The family must have been comparatively well off in this period, a fact which is reflected in his having a portrait photograph taken*. By 1870, John, who was still living in 26 Tamar St., had lost his wife, Betsy, and also his son John jnr. His son had fought in the Naval Crimean campaign but had returned to Saltash to marry in 1860. He later became landlord of the Wheatsheaf Inn on the Beach but died tragically of consumption in 1867. Living with John in 1870 was daughter, Jessie, who now had three children of her own, Bessie, George and Sydney. By 1880 Jessie had died and it was left to her daughter Bessie, a dressmaker, to support the household at the age of 22. 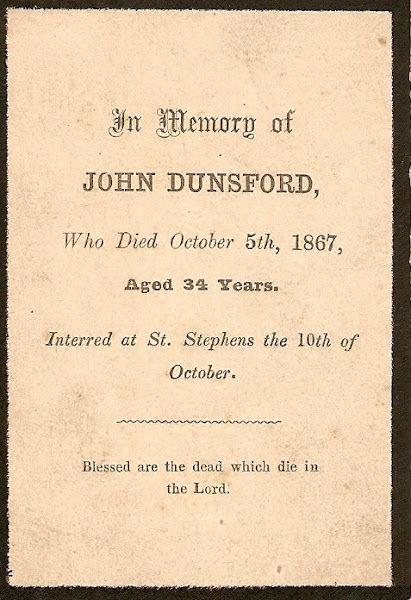 John Dunsford died in 1890 and was buried with his wife and son*. That boy was a very young William Odgers, still a few days off his sixteenth birthday, who was a probably a regular visitor to the Union Inn whilst working on a small coastal vessel out of Falmouth. To his eternal shame William ran away from his responsibilities once his daughter was born and it gradually became obvious that the child was his (they were famously similar in facial features). Firstly, I believe, he ran to the East Coast vessels carrying coal from the Yorkshire fields to London and the South Coast, using the friendship he had developed with one John (known as Jack) Craven whose family were boat builders, owners, and Masters. Craven was a regular visitor to Sutton Pool and other ports on the South and South West Coasts. Subsequently, no doubt prompted by the disowning of Jane by Isaac Stoddon and her own family, William clearly decided it was time to effectively disappear from England altogether. He joined the Royal Navy in August 1852. Before Adelaide was a year old Jane left her parents home in Tamar Street and went to live on the Beach, earning a living as a fisherwoman to support herself and her daughter. During this period she formed a lasting and loving frienship with Ann May who, I imagine, helped with the care of Adelaide (this love was repaid several years later when Ann died). By the end of the 1850s Ann had moved into the Beach as well and had a baby, William, herself in 1859. The great affection that these two women had for each other is in many ways central to this story for without each other to depend on things would have turned out very differently for all concerned. William returned to Saltash from overseas in September 1861 when he joined HMS Cambridge, the gunnery school. He must have expected, or rather hoped, that he could be 'reunited' with his daughter and her mother, however he found Jane six months pregnant and William, not surprisingly, forgotten. Jane never revealed the name of the father of the child. She was apparently happy for William to visit Adelaide which, of course meant that he came to know Ann May rather well. On the first of March 1862 he 'signed on' for a further period of service on the 'Cambridge' and on the 6th March he married Ann. 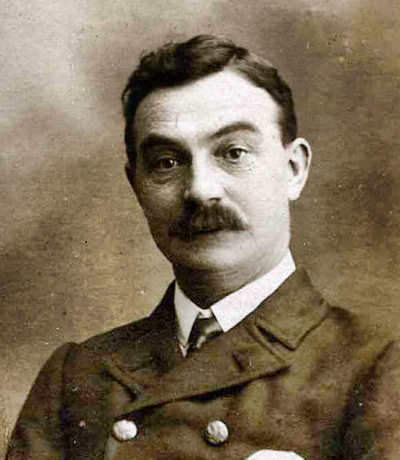 George Odgers was born on 8th March 1863. It is no coincidence that William left the 'Cambridge' only two days later; it had been a difficult pregnancy and Ann was gravely weakened. William joined the Coastguard service and managed to obtain a posting to Polruan which he must have thought would aid Ann's recovery. However, only six months later they moved again, for Ann could no longer cope with the steep hills in the village. This time William was fortunate indeed to find a vacancy at St. Mawes; there could be no finer place in Cornwall for recuperation and, in addition, there was a fine doctor in residence. Unfortunately he quickly diagnosed the cause of Ann's symptoms as the onset of Phthisis (tuberculosis of the lungs). Soon she had to give up her children into Jane's care in Saltash where William and Ann could easily visit them using the new Falmouth link to Brunel's Cornish Railway. We shall never know for certain what transpired between William, Ann and Jane in the following few months up to Ann's death at the end of February 1865, but some kind of understanding was reached in regard to all the children, Jane's as well as Ann's. In early May 1865 William was found guilty of misconduct, most likely for time spent away from his post, and was sent for 'sea service' on the guardship 'HMS St George' which moved 'with him' from St. Mawes to Portland. 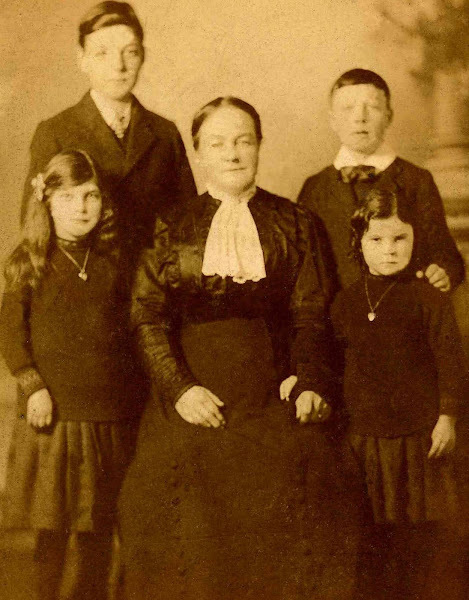 Jane took over the care of the four children, Adelaide, John, William May, and George Odgers, and they lived in William's lodgings at Portland, or in Saltash, where Jane could receive support from her family with whom she was now reconciled. This was a blessing, for in early February of 1867 William joined HMS Rodney which was to sail to Japan for the official opening of several Japanese ports to British trade. William Odgers joined the Royal Navy as a Boy 1C (first class) in August 1852 on HMS Vulture. 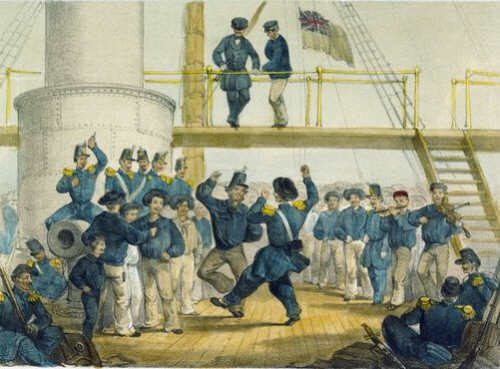 When he reached the rank of Ordinary Seaman on January 1st 1854 he signed on for 10 years Continuous Service Engagement. His service record describes him as 5' 7'' tall with a dark complexion, black hair and grey eyes. This is not at variance with his New Zealand photograph*. William was made an Ordinary Seaman on 1st January 1854, and on the 8 April the Vulture sailed into the Baltic with 48 other vessels to prevent the Russian fleet leaving port at the start of the Crimean war. This war had been sparked off by a dispute over the holy places of Jerusalem but Britain feared a direct attack. It was Finland that was to bear the brunt of the Baltic Fleet's presence. Finland was then part of the Russian Empire with a large merchant fleet and, incidentally, was a major supplier of the tar for shipbuilding imported into Britain. A curious conjunction of circumstances indeed. Whilst the Baltic fleet twiddled its thumbs, the Finns had been preparing for hostilities for some time. In early summer, the British fleet began raids on towns in the Gulf of Bothnia using paddle boats and gunboats, destroying vessels and shipbuilding supplies. On the 7 June 1854 (May 26th in Finland at that time) the Vulture steamed to Kokkola and an infamous episode began, later known as the Skirmish of Halkokari* (the then major port at Kokkola). Around 200 men from the Vulture and the Odin disembarked in 9 oared boats*to destroy shipping materials. The British were ambushed by men hidden at the dock and a fight lasting about an hour took place. The Vulture lost 52 men, killed, wounded or missing. One of their boats was captured and is still on display in the town. William managed to survive the ambush but his boat was badly damaged. This embarassing defeat did not seem to depress the crew of the Vulture for long. Two months later they were dancing on their deck with a party of French soldiers*. A year later, on August 9th 1855, the Vulture was involved in the Battle of Sveaborg*, the sea fortress associated with Helsinki. The action was really limited to a bombardment of the fortress, the city being unharmed. The engagement is thought to have been a political gesture to appease the British public. A huge squadron of British and French warships formed up* about three miles south of the fortifications, the Vulture anchored behind the line of mortar vessels for support and supply. The gunboats were moved into action, within firing range of the fortress for high calibre shells. At 7am the bombardment began. The people of Helsinki were able to watch the spectacle from hills nearby. The fortress responded for the first few hours but were unable to hit the fast moving gunboats. Whilst the fortress was soon on fire, little damage was done to the allied ships, although a rocket tube exploded in the pinnace of the Vulture seriously wounding nine men including William and his friend Henry Searle. The next morning the engagement was resumed until the fires were burning throughout the fortress, but the action was curtailed because most of the British mortars had failed after overheating. The British had used more than 1000 projectiles of one form or another. The Allies claimed that they had caused enormous damage to the fortress and killed about 2000 men. In fact, although the damage was extensive the fortress was still intact, and it is likely that that the number of killed was nearer 100 with perhaps 300 wounded. On the 13th August the ships just sailed away. William Odgers received the Baltic medal for his service. HMS Niger was quite famous before William joined the crew. In 1849 she had been pitted against the paddle sloop Basilisk in tests in the English Channel to compare the effectiveness of the screw propellor against the paddle. 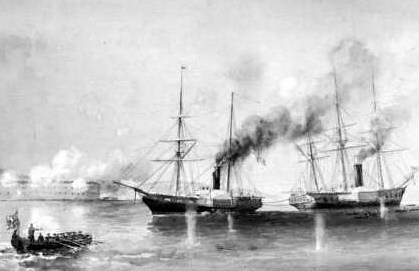 With both ships connected stern to stern by a hawser and steaming against each other, the Niger succeeded in towing the other ship astern thereby demonstrating the superiority of the screw. The Niger had done service in the Black sea during the Crimean war, and after re-commissioning at Woolwich she sailed, with William, for the East Indies and China in June 1856; she was to join the China squadron. China, after the first Anglo-China war or 'Opium War', remained in a state of tension with regard to the activities of certain foreign powers, notably Britain and France. On October 8th 1856, Britain and France seized upon apparently minor difficulties with Chinese officials in regard to their boarding a boat called the Arrow, a supposedly British registered craft flying the Ensign. The British repeatedly sought apologies from the Chinese High Commissioner for this incident; the non-appearance of these precipitated an escalation of violence culminating in all-out battles at the Canton defensive forts*. So began the Second Anglo-Chinese war. By October 25th all the Canton Defences were in British hands but still no apology was forthcoming. Further threats from the British Fleet remained unheeded until open warfare in the Canton river between the British Squadron and Chinese war junks and fire boats developed. It was into this cauldon that the Niger sailed on November 7th 1856, under the command of Captain Peter Cochrane. It was immediately threatened by fire junks and on the 13th November two fire boats exploded alongside but without serious damage being inflicted. This situation continued, with the Chinese using rockets and fire craft, into the New Year. 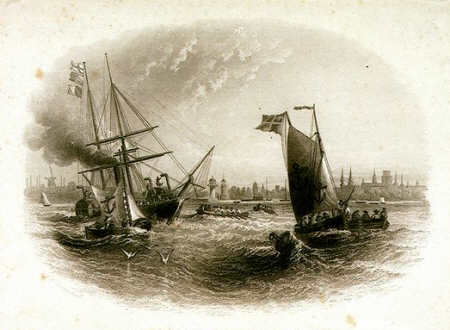 On May 25th 1857 a significant confrontation resulted in a British triumph over 41 junks, using mainly gunboats. The main Chinese force of war junks, however, was at Fatshan Creek* and a major battle took place around 1st June 1857, the British once again using gunboats and gigs from the steamers, including the Niger. As a result of the battle about 80 heavily armed junks were captured, although the Chinese were said to have defended with great skill. Captain Cochrane was wounded in this battle, leading the final 7 mile chase in a light gig from the Niger. The Indian rebellion, which had begun on 10th May, diverted British attention away from the China situation, and troops and ships were lost to suppression of the Mutiny. A final demand for satisfaction was sent to the Chinese high commissioner on December 12th 1857, which, being ignored, led to a bombardment of Canton on 28th December in which the Niger was again involved. Unfortunately, it required the capture of the Commissioner himself to persuade the authorities to see reason. 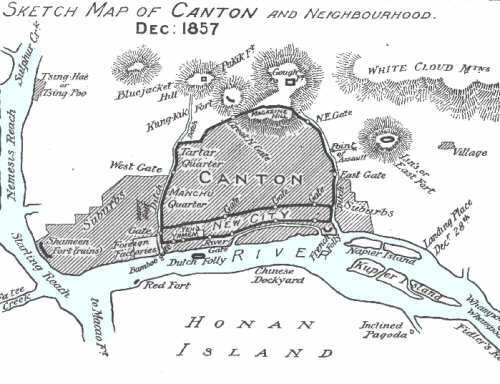 The blockade of Canton was raised on February 10th 1858. Captain Cochrane's injuries caused him to be invalided from the Niger on 8th September 1858 and Captain Peter Cracroft assumed command. He would eventually take the ship to Australia and New Zealand. William Odgers later received the Second China War medal with Fatshan and Canton clasps. 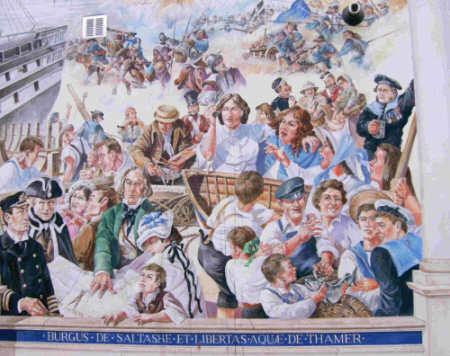 He had shown himself to be a courageous and resourceful fighter (Blue Jacket) as well as a fine sailor. The First Taranaki War* was started by a land dispute. The number of settlers in the North Island of New Zealand were approaching those of the Maoris in 1860, and they were looking for more land to farm. A minor Maori chief sold a block of land known as the Pekapeka block at Waitara* to the British, without the agreement of the paramount chief, William King. The New Zealand Governor accepted this offer, anticipating that this would cause trouble, and perhaps hoping it would bring matters to a head. After initial skirmishes in February 1860, Governor Browne declared martial law in Taranaki and initiated the sale of the land block. On 4th March Browne ordered the commander of the British troops (65th Regiment) , Taranaki Militia, and Rifle Volunteers, Colonel Gold, to occupy the block and prepare for surveying. On the night of 15th March King's Maoris built a Pah, or defensive stockade, on the land; this became known as the 'L' shaped Pah. 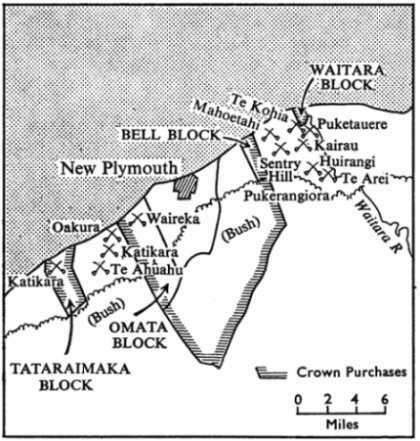 On March 17th, without determining whether the Maoris had the right to build this defensive fort, Gold ordered his men to open fire on the Pah, using shot, shell and rockets. One mounted volunteer was killed that evening, when approaching the Pah. The following morning the place was found deserted - this was considered a moral victory for the Maoris; moreover, under Maori law, the aggression of Gold established him as the wrongdoer and allowed support for King from warriors from further afield. Around 500 marched on the New Plymouth area and built and entrenched a stockade near the Waireka river called Kaipopo Pah* about 6 miles south of New Plymouth. The murder of five settlers nearby on 27th March induced panic in New Plymouth, with settlers flocking into the town from outlying farms. At about 1pm on the 28th a large force of around 300 troops, volunteers, and riflemen, set off south west from the town towards the Waireka river area, about 5-6 miles distant, to bring any stragglers from the settlers back to safety in the town. Gold ordered his troops, under his second in command, Lt-Col. Murray, to take a route by the South Road*, whilst the remainder went by the coast. In this way he hoped to cover the area around the river, near Omata*, where the settlers were thought to be. Murray was given orders to return before darkness fell. Captain Cracroft in HMS Niger had just returned from Auckland to New Plymouth after picking up supplies, and was anchored off the town, in fine weather, when he heard the 1pm guns from the barracks signalling the departure of the British force. He anticipated that this signal meant that an attack was under way, so he and a force of 60 Blue Jackets went ashore as soon as they could to render assistance. 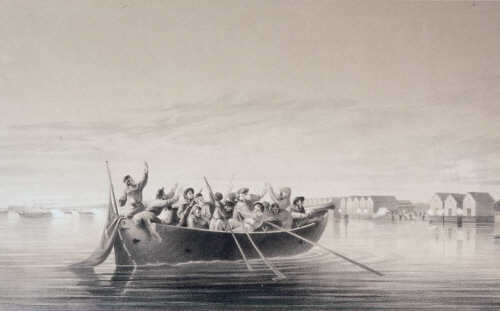 Gold asked Cracroft to take ammunition and to reinforce Murray's band. They responded immediately to this request and made their way, initially, to the Omata blockhouse on the South Road to await the supply of ammunition. As it happened, they found here two wounded men from the Niger; these were from a small party that had been left to support the troops when the Niger sailed to Auckland. One of the wounded was the much admired Lt. Blake who had taken a musket ball in his chest, close to his heart. From the blockhouse Cracroft had a commanding view of the whole Waireka area*. He could see the Kaipopo Pah*, its three flags, and the gunsmoke emanating from the rifle pits. The whole region seemed filled with 'the rattle of musketry' from the exchanges between the Maoris and the various groups of volunteers* in and around the river and the Jury's farmhouse*. Having sent the ammunition to Murray, Cracroft called his men together to set out his plans. Most of them, of course, knew nothing of their enemy but Cracroft had previously explained the Maori methods of fighting and praised their courage. He had also armed and trained his men appropriately for skirmishing. At the Stockade he asked his men if they would support a direct assault on the Pah, knowing that they sought revenge for what they thought was the death of Lt. Blake. By now it was 5.30 pm and darkness was already falling. 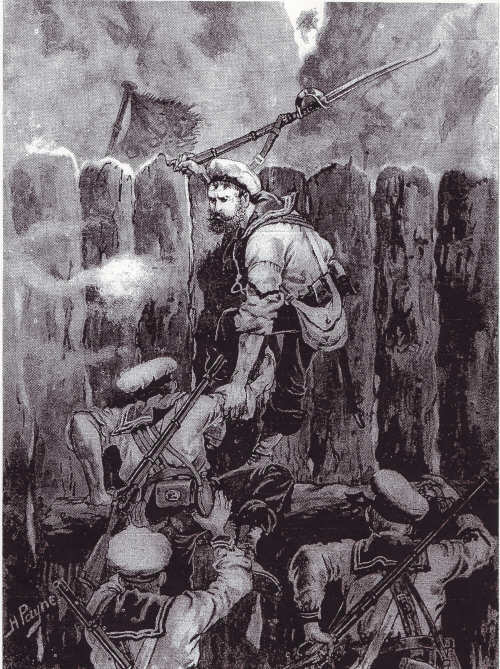 The men, no doubt much affected by the injuries to their comrades, were unanamous in their wish to move against the Pah. They set out, soon passing the spot where the five settlers had been murdered previously. The bodies of their slain bullocks still remained by the South Road. Near the village of Omata Cracroft set up a rocket tube at about 800 yards from the Pah. Having fired 6 or so rockets without effect in the half light, much to the chagrin of William and Henry Searle, a messenger arrived from Murray informing the Captain of his decision to return to town and advising Cracroft to do the same. The Captain was now faced with the most difficult of decisions. Whether to attack a heavily fortified Pah in the darkness, without support, and with a band of men who were generally unfamiliar with the nature of their opponents, or to turn and to follow Murray back to town. He reasoned that his Blue Jackets were experienced in close combat fighting from their battles in China, were suitably armed with revolver and cutlass, and that the cover afforded by the darkness might actually be in their favour giving the opportunity of surprise. He gave the order to advance upon the Kaipopo Pah. Before reaching the Pah two of his men were wounded in a Maori ambush; but this only served to spur his men on, and whilst his sharpshooters disposed of the riflemen in the pits a flanking assault including William and his friends, rushed up to the Pah and into the stockade, following the fleeing Maori who had never seen the like of this type of battle. William was the first into Pah with his group, and being armed with revolvers they were able to cause mayhem in the enclosed compound until the Maori fled once more out of the rear of the Pah and into the darkness. Cracroft later noted with satisfaction William's conspicuous gallantry . Two days later,on March 30th, the Governor requested the Niger sail 20 miles south to destroy the stockade at Warea Pah where the fugitives were thought to be encamped. 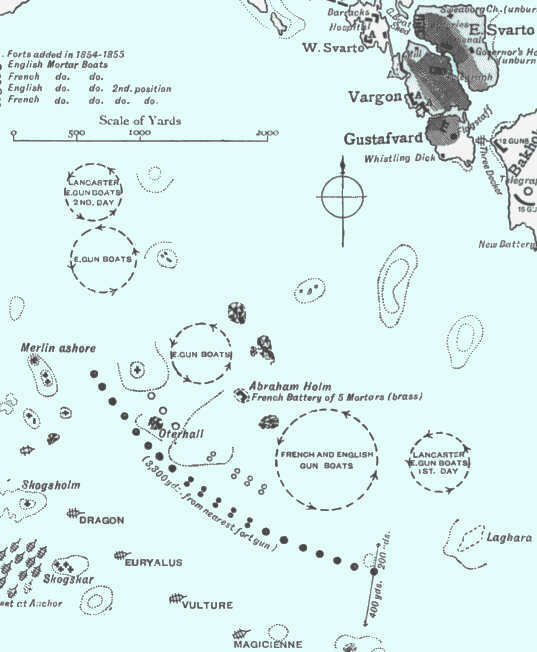 After considerable difficulty finding a suitable anchorage near the Pah, the Niger opened fire at 2000 yards, sitting in a heavy swell. A first shot using a 68 pounder dropped close and the Maori fled the Pah. The second 24 pounder shot fell into the Pah and seemed to set the stockade on fire. 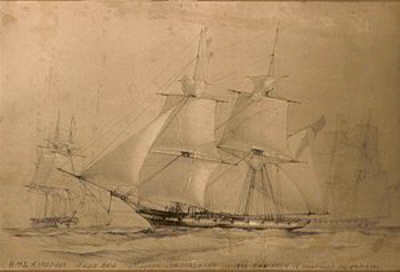 The ship's position being critical in the raging surf, the Niger then raised anchor and steamed back to to Taranaki. In the London Gazette of 3rd August 1860 it was announced that the Queen had conferred the Victoria Cross on William Odgers for: 'On the 28th of March, 1860, William Odgers displayed conspicuous gallantry at the Storming of a Pah during operations against Rebel Natives in New Zealand; having been the first to enter it under a heavy fire, and having assisted in hauling down the enemy's colours.' He was also promoted to Captain's Coxswain from 12th July 1860, although he had been fulfilling that role since soon after leaving China. It has often been said that Cracroft promised £10 to the first person into the Kaipopo Pah; no such payment is recorded on William's service record, but there is a note to the effect that a payment of £50 was made in the relevant period. 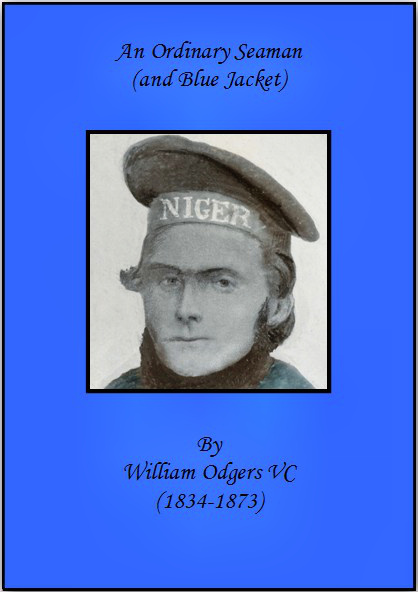 William only served on the Niger until September 1861; he then returned to England to serve on HMS Cambridge, training naval ratings in the use of naval guns. The Cambridge was originally moored at Plymouth but was moved at sometime to a position at the mouth of St. John's creek, Torpoint. As seemed to be the common practice with sailors nearing the end of their CSE commitment, William was posted to the Coastguard service on 11 March 1863, almost certainly at his own instigation. William's exemplary service record throughout his career continued in the Coastguard Service where his expertise was once again used in the training of young naval recruits. During the course of his four-year service he served as a Boatman at Polruan and St. Mawes and as Captain's Coxswain on board the guardship HMS St. George at Portland. There was only one minor hiccup when he was found guilty of misconduct at the end of his service at St. Mawes. This was no doubt associated with his time away from his post when his wife, Ann, was dying. In February 1867 William joined HMS Rodney as Admiral's Coxswain for her service as the flagship of Admiral Keppel at the China Station. She was actually under the Command of Captain Algernon Heneage for the journey out, Keppel having gone overland earlier in the year. On the 1st January the Rodney, along with her accompanying flotilla, became the first foreign ships to enter the port of Kobe in over 200 years. A few days after the opening William was involved in the dramatic escape of the Rodney's steam launch , carrying a delegation including the Admiral Keppel, out over the sand bar at the mouth of the river at Osaka. The very next day the American Commander-in-Chief, Admiral Henry Bell was not so lucky when he was drowned at the bar along with twelve of his crew. Unfortunately William was taken ill as a result of the incident and in July 1868 returned to Plymouth on a troopship, the Tamar. Fittingly, she was an iron hulled, iron screwed, sign of the times. She was to have an interesting life; she was stationed in Hong Kong harbour from 1897 to 1941 where she was finally scuttled in the Second World War. 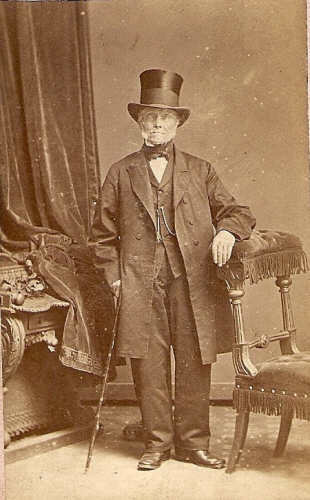 William retired as a Superior Petty Officer on 14 August 1868, and he married Jane five months later in the Plymouth Registry Office. 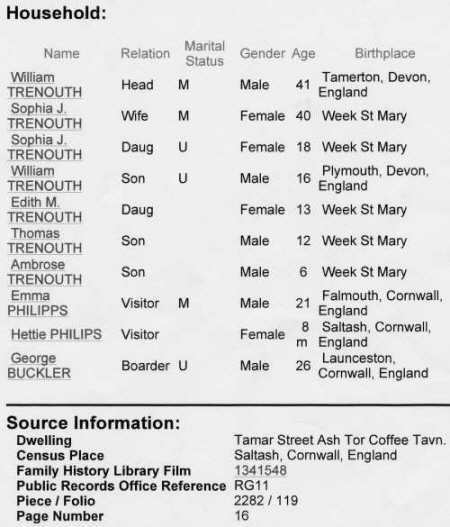 Immediately prior to the marriage they lived in lodgings in Buckwell Road, Plymouth, close to the Barbican and Sutton Pool. The intention here was undoubtedly twofold; to remove the risk of objections to their marriage (which was of course, bigamous, since Isaac and Jane had never obtained a divorce) and to meet their friends, such as John Craven, to invite them to the reception in the Union Inn. This action was to have a momentous effect on my family tree, indeed I would not otherwise be here. For at the reception Adelaide met John Broadbent Craven, Jack's son aged 17, for the second time (the first was at William's first wedding in March 1862). The rest, as they say, is history. 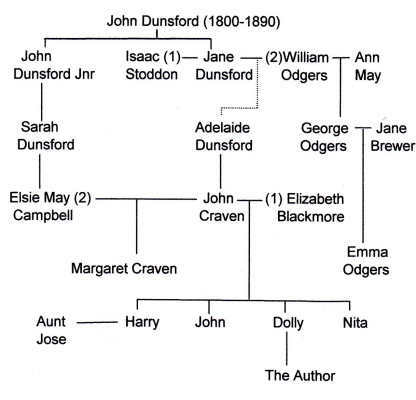 They were married in 1872, and shortly after began the creation of the Odgers-Craven-Dunsford dynasty, my Grandfather, John Dunsford Craven being the first member. William created a home for Jane, Adelaide, and the rest of the children, George, John and William in the Union Inn of which he was the landlord up until his death in 1873. It seems that he saw those last few years as part of his redemption for what he came to see as his sins in love and war. It is thought that he never wore his medals and there are certainly no photographs of him, other than that taken in 1860, which is often displayed with a complete set of medals painted on. He did receive his VC at devonport in 1862 but he made it clear at the presentation that there were 'many men there as brave as he'. He left the Cross and his New Zealand medal with his beloved Jane and Adelaide to do with as they wished. Jane died in 1901 and Adelaide sold them in 1902, it seems as if she could never forgive him for his 'desertion' all those years ago. Although the headstones of graves of William's period have been moved in St. Stephen's, Saltash, church records indicate that William and his first wife rest only a few feet in front of the rather splendid memorial*. The lilies, placed sometime in early April 2007, show that William is still remembered. Isaac Stoddon was born in 1824, and it is likely that his mother died giving birth, since her death, recorded on the Stoddon family headstone* in St Stephens, is given as the same month. Isaac was sent to sea at the age of 13 in 1837. This was not at all unusual, particularly since he was motherless. However, it does mean that there is very little record of him outside of his naval career until he was a Greenwich pensioner. We do know that his family shared a house with the Dunsfords in Tamar St. in 1841. It is likely that this situation pertained for some years prior to that time. In which case Jane Dunsford and he would have known each other as children. 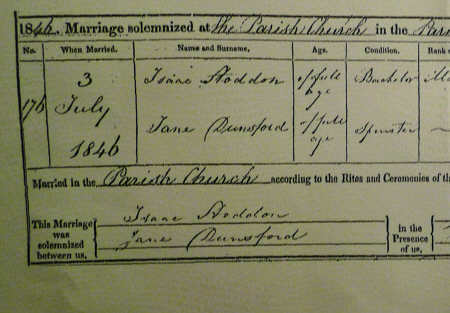 We also know that he married Jane on the 3rd July 1846 in Stoke Damerel Parish Church. Two children were born to the marriage, however Isaac was the father of neither of them; Adelaide was born on 16th October 1850, and John on New Year's Day 1862. As a result of Adelaide's birth, and here we know who the father was, Isaac, informed of events by his sister, Charity, who still apparently still lived in the same house as the Dunsfords, disinherited his wife Jane, although they never actually divorced. 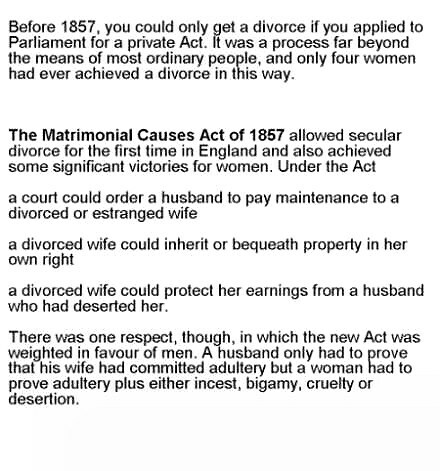 In spite of the then recent Matrimonial Act, divorce remained beyond the reach of ordinary folk. Aside from those few facts, his naval career was his life for 27 years until he retired in May 1864. He then returned to Saltash and got 'married' again in 1867 to a widow called Louisa Kitt, in the same church and with the same minister as in 1846! He will have contacted Jane before this 'marriage' to ensure her silence on the matter. She would have been quite agreeable. Perhaps as a result of this meeting and the subsequent one that William must have had with Isaac about his 'marriage' to Jane, they must have became the best of friends. It is certainly known that Isaac and William became drinking pals. Isaac lived happily in Fore St. with Louisa until he died of the Phthisis in 1876. There are no images of Isaac available. His service record describes him at age 40 as 5ft 3ins in height with a sallow complexion marked by smallpox, grey hair and blue eyes. The smallpox will no doubt have been suffered during his service. Before looking at Isaac's career in detail, it is worthwhile to read the section here on the Suppression of the Slave Trade, since so much of Isaac's Naval service was concerned with this. Isaac entered the Service as B2C (Boy Second Class) and his 5 years in the Sappho saw him fully trained to Ordinary Seaman. He was fortunate indeed to join the Sappho* upon entering the Service, because she had only been launched in February 1837 and she was one of a class designed to be very fast whilst carrying heavy fire power. She was built for the suppression of slavery*, and sailed to the West Indies and North America Stations for the period 1837-1842. What an experience for a young lad. Later in life the Sappho was the centre of a famous diplomatic incident when she seized a US barque in 1857 believing her to be engaged in the slave trade, and later had to pay compensation to the owners. In 1858 the ship was lost with all hands off the Australian coast. it is believed that she capsized in high seas, a consequence of her rigging and heavy armament. This ship* was captured from the Spanish Navy at St Vincent in 1797 by Nelson, himself, in Captain. From 1841 she served as a guard/gunnery ship, anchored off Plymouth. 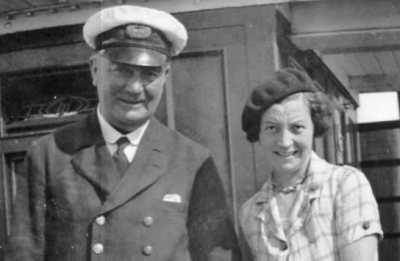 Long after Isaac's service in Penelope, she had an unpleasant experience in the Baltic War which made her and her saviour, Captain W H Hall of the Hecla, famous. During the attack on the fortress at Bomorsund Penelope ran aground on an uncharted rock, and, as a sitting duck, taken a score or more hits from cannon. In an effort to refloat the ship the crew threw all her guns over the side before Hecla pulled her off*. Some of the guns, at least, were recovered subsequently by the famous sapper and diver 'Sergeant Jones'. Isaac joined the Penelope as an Able Seaman at the time when she became the flagship of William Jones, the Commodore of the West African Squadron, involved almost exclusively in suppression of the slave trade*. The Penelope, being the flagship, had the primary task of overseeing the operations of the 25 or so ships on the coast, and to keep them supplied with coal, food and water amongst many other things. One of the monthly reports from the Commodore to one of the Admiralty Secretaries is shown here* to illustrate the nature of the job. Part of the letter is highlighted to emphasise a most important concern of all Captains in the Squadron - susceptibility to disease in coastal work, particularly in the very unpleasant conditions up the Gallinas* river. Whilst all the Brigs had at least one surgeon and one assistant on board, the Penelope had one surgeon and seven assistants to cope with the many attacks of fever in the fleet. She was therefore something of a floating hospital in addition to everything else. This was indeed a most important element of her duty; in 1829, for example, 204 out of 792 men in the Squadron had died, mainly of malaria or yellow fever. It is likely that Isaac contracted his smallpox either whilst on the Penelope or later in East Africa whilst in service on Gorgon. Smallpox was endemic in most regions of Africa at the time and conditions for its spread were exacerbated by the slave caravans. Often a slave ship would be ravaged by the disease*( see the revelation of Richard Drake, slave smuggler). In the first eight months of 1845 HMS Penelope travelled to the Gallinas river* twice, Accra, Lagos, Ascension, St Helena, Sierra Leone, and the Cape Verde Islands collecting and distributing food, water and fuel. On the 22nd March, while anchored off Lagos, a suspicious ship, behaving in the characteristic manner adopted by slavers, was identified and the Penelope, herself, gave chase, firing her guns. The quarry then showed American colours, a ploy often adopted at that time to prevent boarding. A passage* from James Hall's book about the conditons on the Gallinas river, and their later improvement, is included here to show that the efforts of the West Indian Squadron were not in vain. HMS Inflexible, 1st class sloop, wood, paddle. 1100 tons, 6 guns. Isaac joined Inflexible in August 1846 as an Able Seaman and took part in the remarkable 1846 voyage from the Cape to Australia in 35 days. 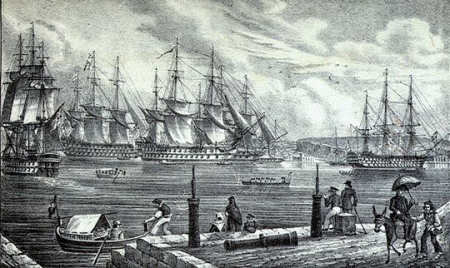 In fact, the entire voyage of Inflexible from Devonport to Sydney in 1846 was the first approaching the character of a steam passage to Australia, and had highly satisfactory results. Her arrival at Port Jackson was said 'to form an epoch is colonial history' and the performance of her voyage, particularly from the Cape, to 'mark an era in the progress of navigation by steam'. It was the 'longest run at one stretch of any steamer in the annals of steam navigation'. There was little about the Inflexible herself that fitted her particularly for this record voyage. It was basically down to maximising the efficiency of the combination of steam and sail. Inflexible had direct acting marine engines of around 375 horse power, but these were fitted with 'expansive gear'. The operation of the expansive principle made great savings in the expenditure of fuel. As the action of wind on the sails increases, so there is obviously less steam power required in order to maintain the target speed. The expansive principle cut off the steam in its passage to the cylinder, thereby allowing the piston to work expansively and more effectively. Further efficiency lay in the method of 'disconnecting' the paddles when not in use; the process had been in use by war steamers for some time, but in Inflexible it was on a different principle from that formerly in use. It employed a friction strap and took up only one-tenth of the time to disconnect as it only required the turning of two screws, and the striking aside the keys which connect the parts, in order to set the paddles free of the engine. In the passage made by the Inflexible, from the Cape to Sydney, the distance made under steam was not less than 5500 nautical miles, at an expenditure of only 455 tons coals, and at speed of eight knots. The average speed, when under sail only, exceeded seven knots per hour. She left Simon's Bay at 2 pm on the 8th November 1846, and arrived at Sydney at half-past 8 pm on the 13th December, 1846. Considering her primary duty was to carry large quantities of ammunition, which would have detracted somewhat from her performance, it was a remarkable achievement. Extracted from The Shipping Gazette 20th February 1847. Isaac returned home from the East Indies on the Ringdove* in May 1849 to join the mighty Queen* for 7 years service in the Mediterranean. In the period in question the Queen was on duty in the Mediterranean, based at Malta*. By far her most important engagement in this time was with the British Squadron in the Black Sea during the Crimean War*. Isaac, as a Queen's Bosun's Mate, would have had a role in looking after the ship itself, anchors, ropes, deck crew and boats. Onboard a sailing man-of-war he would help inspect and maintain the rigging, take his turn at the wheel, and it was his duty, if delegated to do so, to summon the crew to work by the bosun's whistle. He might also administer corporal discipline, either informally, with his bosun's cane on the boys, or with a rope's end on the adult sailors, either on an officer's or the bosun's instructions. In the event, he would not have joined the parties* leaving the boat to fight or help onshore but may well have been involved in the selection of the most suitable men for the work in hand. He certainly would have been on the Queen during the bombardment of the Sebastopol forts which is described in detail here. During the bombardment the Queen was lashed to the paddle steamer Vesuvius which manoeuvred her into position. 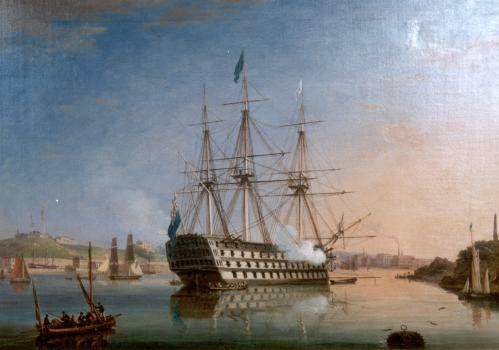 Rather sparse details of the engagement are given by Admiral Dundas's despatch to the Admiralty* which is shown here in part but is readily accessible online. During the engagement the Queen caught fire and suffered the loss of one crew killed and seven wounded. 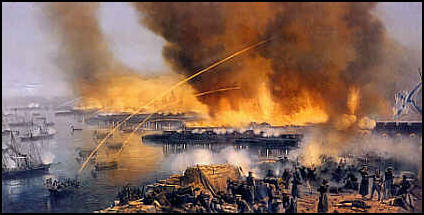 In comparison the Sanpareil lost 11 killed and 59 wounded. The total casualty figures 0f 44 killed and 266 wounded are given in the Dundas report*. Isaac Stoddon was given his Crimea medal with Sebastopol Clasp on board the Queen. 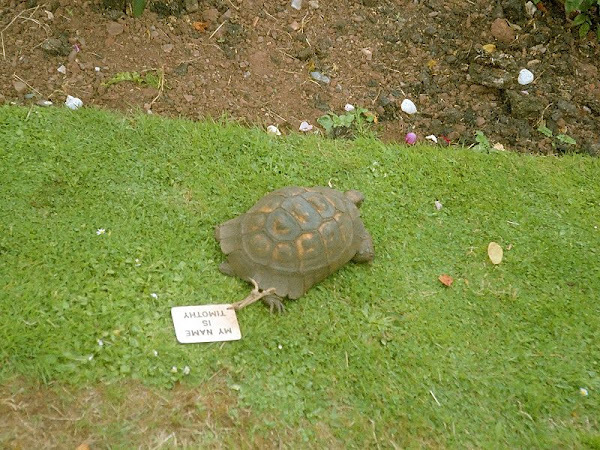 Another survivor of the battle, who was to become the longest living survivor of the Crimean war - by some distance, was Timothy the Tortoise*. He was in fact a she and was the Queen's mascot at the time. She retired in 1892 and was taken in by the Earl of Devon at Powderham Castle, where she died in April 2004. Strange to think both Isaac and John Dunsford were acquainted with her. After his long service on the Queen, Isaac returned to Devonport on the Impregnable, a Victory 'lookalike'. 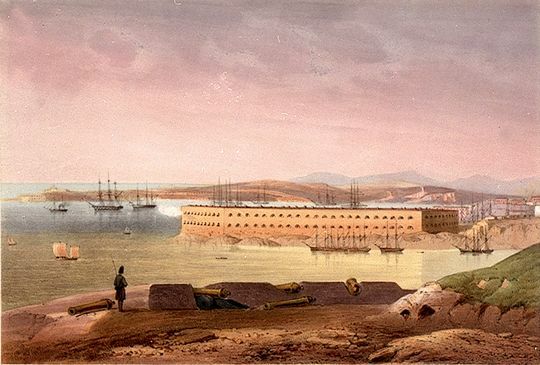 She was at the time the flagship of Admiral Parker at Devonport, but in December 1856 was succeeded in that role by the Indus, which Isaac joined. For nearly three years the Indus stayed in Devonport as the flagship for Rear-Admiral Stewart. 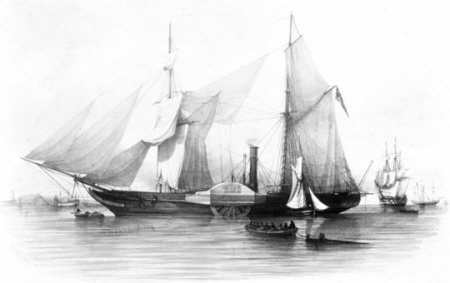 On 12th August 1859 the Admiral then took the Indus to the North American Squadron to be the flagship at Nova Scotia. The West Indies was part of the North American Station, so this posting must have been relatively pleasant for Isaac who was by now the Chief Bosun's Mate. 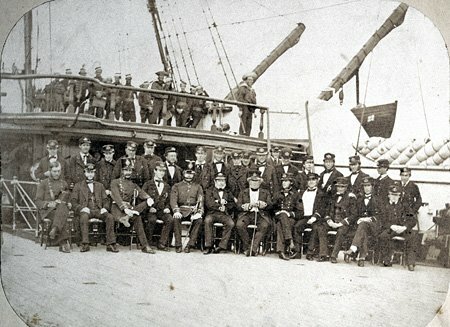 Whilst in Bermuda, on March 4th 1860, the crew of the Indus had their photograph taken*. Soon after, on the 16th March 1860, Isaac transferred to the Emerald in Bermuda to return to Plymouth for service in the Channel. Isaac returned to Plymouth on the Emerald on 4th July. For the next month there followed some ceremonial events with the arrival Plymouth of a young Edward, Prince of Wales, and the performance of a variety of other, more mundane, duties. On August 27th the Emerald went to Alderney in the Channel Islands carrying about 200 Artillery men, and about 50 women and children. She moored inside the breakwater in Braye Bay, disembarked the troops etc and remained moored there till early the next morning. The disastrous next day in which the Emerald was grounded on a rock is recorded in the Ship's log*. The local Pilot was blamed for the error, but the event is still remembered on the Islands. In 2001 commemorative stamps were issued*. On 1st November Isaac joined the Gorgon* for service around the Cape of Good Hope. From March 1861, the Gorgon was under the leadership of Commander John Wilson engaged on suppression of the slave trade on the East Coast of Africa, and was based at the Cape of Good Hope. She was also called upon to assist in the activities of Dr Livingstone during his exploration of Lake Nyassa and the establishment of a mission at a place called Magomero, near the Lake. She, and her crew, are referred to extensively in his diary over the period February - March 1862. On the 30th January 1862 the Gorgon arrived at the mouth of the Zambesi, towing the brig which brought Mrs Livingstone, and a group of ladies about to join the mission, from the Cape. The Gorgon also brought 24 sections of a new iron steamer that was to be used for the navigation of the Nyassa. Commander Wilson and his crew stayed to help discharge the the cargo, which was a much more onerous task than expected because the river was in flood. It was resolved to land the sections of the vessel at Shupanga and put the hull of the vessel together there. Before they reached Shupanga, Commander Wilson realised he and the crew who were with him would have to render further assistance to the party of mission ladies. (Continued in Livingstone's own words*). Commander Wilson arrived back at Shupanga on 11th March having been 3 weeks on the River Shire. On the 15th he went downriver to find that the Gorgon had been driven out in a gale and it was 2nd April before she returned; fortunately she had obtained supplies. The Gorgon left for the Cape on 4th April taking back all except one of the mission party. Livingstone expressed his heartfelt gratitude to Wilson and the Gorgon crew for their kindness and cooperation. Sadly Mrs Livingstone died of the fever just 3 weeks later. The Gorgon had one last important job to do; she was sent to Madagascar in 1863 to restore order after rioting had broken out following the assassination of the king, Radama II, on 12th May. She then returned to Portsmouth via the Cape, on 29th January 1864. She was decommissioned on 11 February and Isaac returned to the Indus at Devonport where she was doing duty as a guard ship and the flagship of Rear-Admiral Symonds. He received his discharge letter and retired as a Senior Petty Officer on 11 June 1864, and returned to Saltash. 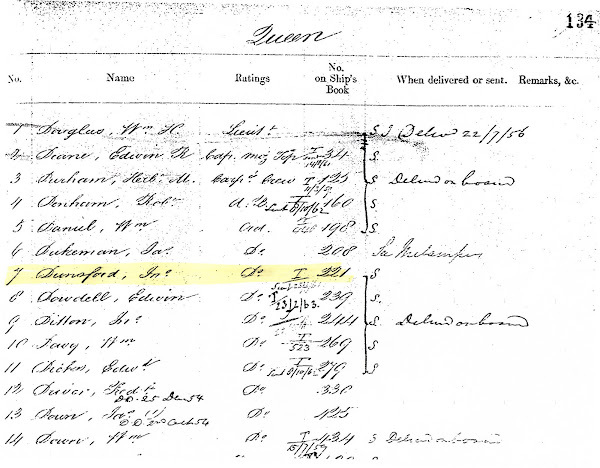 John was born in Tamar St. in 1833 to John Dunsford Snr. and his wife, Betsy. He followed his father into working on the water and is recorded in 1851 as a fisherman aged 18. By 1861 he had married his wife, Sarah Dunsford, but still lived in the same house as his father. His work at that time was described as a 'labourer in laboratory'. This referred to his working over the Bridge at Bull Point on the refurbishment of ships' gunpowder. On return from a tour of duty they would unload their contaminated powder, and pick up fresh before leaving on their next voyage. John's job would have him wheeling kegs of gunpowder to and from the docks and within the laboratory itself. This was not popular or healthy work. 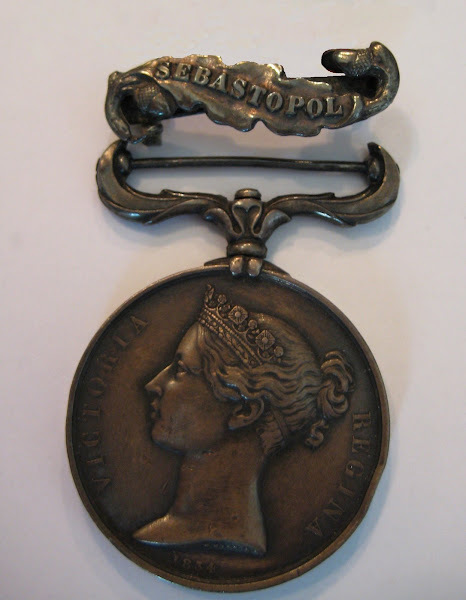 Knowing that he had the Crimean Medal with Sebastopol Clasp* I reasoned that with his background he probably joined the Royal Navy sometime in the period 1851-1861, when war with Russia was threatened, and served in the Black Sea. Since he did not sign up for CSE there is no record of his service. I considered that if he volunteered for service in his early twenties he may well have joined the crew of the Queen because of a Naval policy in which ships' crews were recruited from the same regions, as far as possible. Sure enough, the Queen's Roll for the Crimea Medal* has a John Dunsford on board. 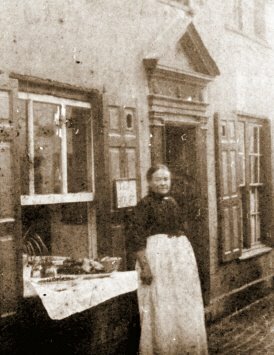 John had two daughters in the 1860's, Sarah Jane, and Althea Bessie, and became the licensee of the Wheatsheaf Inn on the Waterside. Tragically he died of TB on October 5th 1867*, when his mother Betsy was at his bedside. 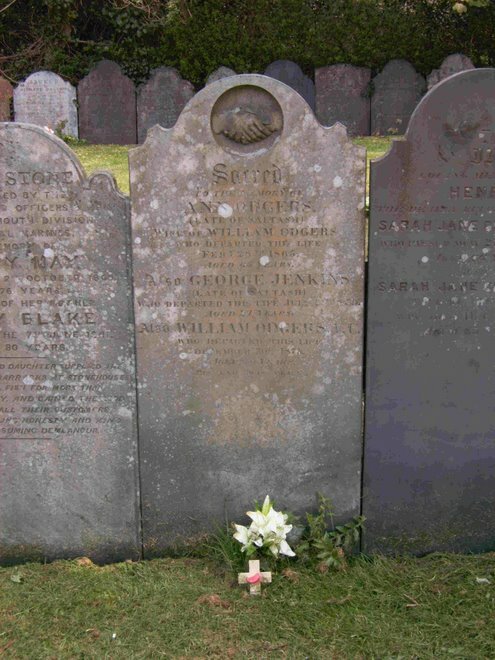 His mother and father were later buried with him* in St. Stephens, Saltash. Just before his grandmother's death in 1901, Adelaide's son John Dunsford Craven, a master mariner like his father and grandfather, married a girl from Forder, a beautiful village in the valley down from St Stephen's Church. She was born Elizabeth Blackmore from the marriage between Henry Blackmore and Emma Brewer, a widow, the daughter of Nicholas Allen. The Allens were an old established family in the village, and Henry and his sister Mary, who were originally from Topsham, married siblings in the family. 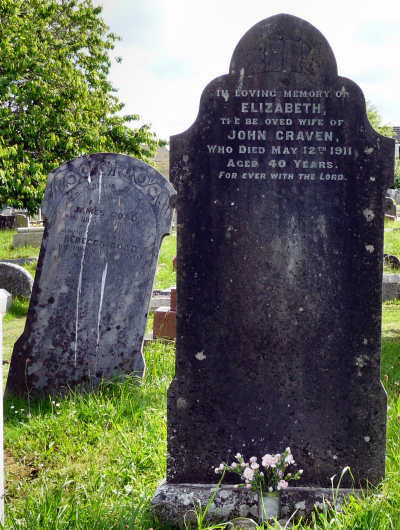 Elizabeth Craven, who was my grandmother, produced four children under 10 between 1901 and 1911 and then disaster struck when she died at the age of 40. She was buried in St Stephens Churchyard with a headstone which remains uncannily flawless to this day*. My grandfather, a master mariner, was left with his grief and four small children to care for. It was only natural that his mother, Adelaide*, would come to his aid in respect of the children, but she had already brought up one family of four and was now sixty years old, hardly the time of life to take on another four children aged under 10. An accomodation was reached, no doubt after several family conferences. Adelaide would look after the two girls, and the two boys who were significantly older would live nearby with George and Aunt Jane at No.9 Fore St. Even so, it would mean the two boys sharing a bedroom with their grandfather, Henry Blackmore. Regardless of the these arrangements the family still remained a loving unit as shown in the photograph taken of Adelaide with all the children* in 1914. Adelaide went on to live to the age of 88, dying in 1938. To put this in perspective, my grandfather, John Dunsford Craven, Adelaide's oldest child, was 64 when she died, my mother was 30, and Auntie Jose 33. Auntie Jose's husband, Harry, my uncle, was 36, and he it was who was the source of most of my knowledge of the Waterside families. It seems that Adelaide, perhaps understandably, never forgave William for his desertion, only relenting for a moment when he was about to die. She never took the name Odgers, always using Dunsford until her marriage to John Broadbent Craven in 1872. Even on her marriage certificate she maintained her independence, entering for the name and occupation of her father the, rather generic, 'John Dunsford, sailor'. H0wever, there was one respect in which she could not deny her father. Her tight lipped smile and piercing eyes gave her a remarkable resemblance to him, a fact that was often commented upon, much to her chagrin. 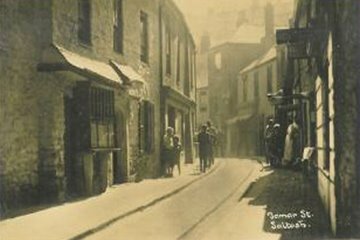 By the time of Elizabeth Craven's death George and Jane Odgers were in their late forties and had moved to 9 Fore Street, Saltash and had a daughter of their own, Emma Jane, born in 1909 and always called Emmie. George's wife, Jane, was born Jane Brewer*, the daughter of Emma Brewer's first marriage. She was therefore Elizabeth Craven's half-sister, and they were great friends. George's stepmother, Jane Dunsford, was Elizabeth's children's great-grandmother. These ties provide some explanation for their great self-sacrifice in taking on the care of John and Elizabeth Craven's two boys Harry and John, my uncles. The arrangements thus made remained in place until all the children were grown and John Craven remarried. Though, no doubt, there were financial hardships and other difficulties along the way, personal accounts of those times emphasise the great love and affection that was shown the children. This is reflected in all the photographs from that time. My Aunt Jose at age 101 still remembers how wonderfully generous and kind George Odgers was. An unassuming man, he very rarely mentioned his father's exploits but poured his energies into looking after his extended family. Who is to say who was the greater hero? Neither George nor Jane liked to be photographed, so the ones shown are rarities*. 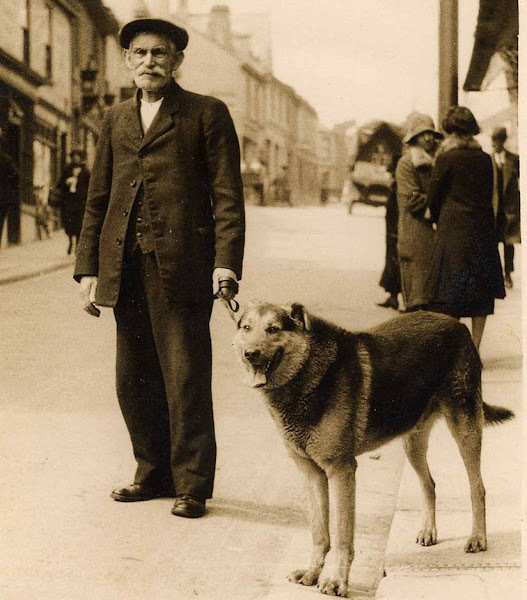 One has George in Fore Street with Harry's dog Kuno. 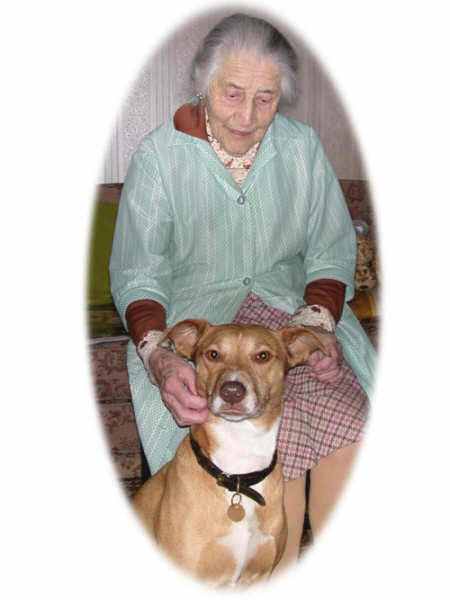 George loved the dog and Harry left him with George when he married Aunt Jose and left for Devonport. The other shows Aunt Jane with Emmie in the backyard at No 9 Fore St. One can see from the expression on her face that Aunt Jane was less than pleased to be in the photograph. 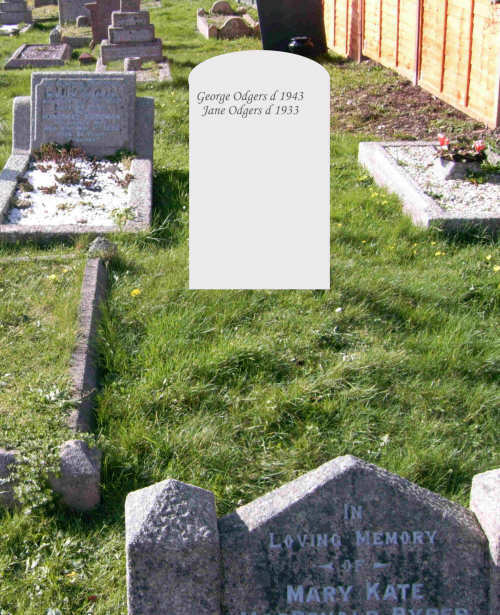 I'm certain this is now the only picture in existence of George Odger's wife. Aunt Jane died in 1933 and George Odgers in 1943. They are buried together in St Stephens*. Emmie Odgers was born in 1909 in 9, Fore Street, and lived there, or in Tamar Street, for her whole life apart from a last few years spent in a nursing home where she died in 1981. She was born slightly deaf, a disability which, in those days, caused her a host of problems. She was slow to talk, could not manage at school, and as a small child was generally regarded outside her family as mentally handicapped. The arrival of John Craven's boys after the death of their mother was a blessing in disguise for Emmie. They were several years older than Emmie and became her protectors and part-time teachers. Their sisters, just up the road, were of a similar age to Emmie and they became inseparable friends. 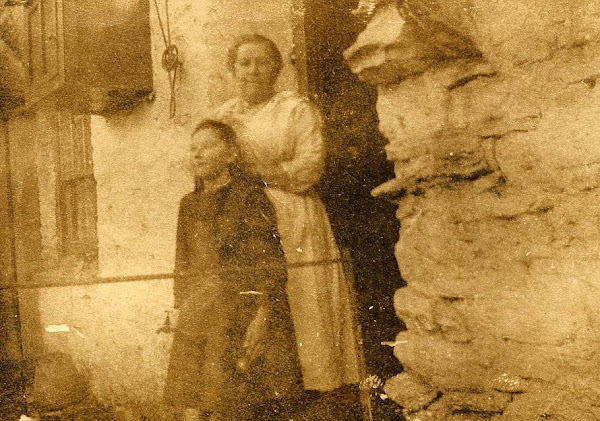 After what passed for her schooling, Emmie worked with her mother taking in washing. The methods employed in those days involved open fires, boiling water, and scrubbing and mangling. Emmie was 'brought up to the tub' and her early life was hard in the extreme. Emmie's particular task was to collect the dirty, and deliver the clean, washing. This sounds a reasonable job until account is taken of the location of Emmie's house at the bottom of Fore Street, when most of her customers were in the posher parts at the top. Aunt Jose remembered her trudging up and down Fore Street with huge baskets of clothes, muttering or singing to herself. It wasn't long, given this kind of life, that the roles were reversed in her relationships with John Craven's children. She became very protective towards them, and with her booming voice and forthright manner was an intimidating figure. When her mother 'Aunt Jane' died in 1933, Emmie was only 24. She stayed at home continuing to take in washing and to look after her father who was now 70 years old. 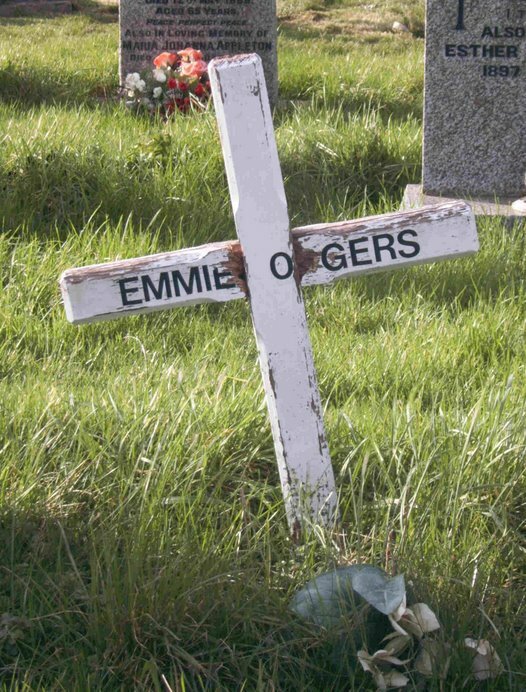 George Odgers died in 1943 and Emmie was left alone. Her childhood 'brothers and sisters' had long since left to lead their own lives outside Saltash. Emmie had had a particular fondness for Harry Craven and it was his wife Aunt Jose who would continue to 'see Emm's a'right'. She made twice weekly visits to Saltash from Devonport, across the Brunel bridge on the 'Saltash motor' a small engine used for local passenger services. In the 1950s and early 60s I spent all my holidays with Aunt Jose and accompanied her on all her afternoon visits to friends and relatives spread throughout the area from Cornwood to St. Germans. I got to know Emmie, in particular, quite well although I must admit to being terrified by her stare and loud voice when we first met. 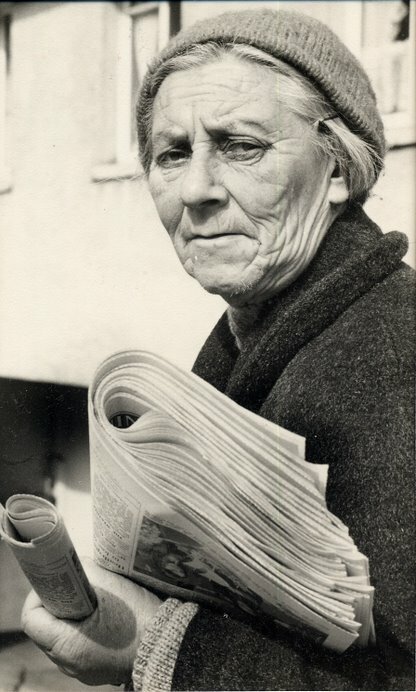 Emmie joined the firm of Dingle and Co. in 1947 delivering morning and evening papers. She was ideally suited to this job by reason of her stamina gained from carrying washing. She also knew where everyone in Saltash lived. It is a matter of record that in the 29 years she worked she never stayed home ill once. One day she did fall over on the ice and have to visit hospital, but she was back at work the very next day. Up to the time she retired she lived at the bottom of the hill which she climbed four times a day. She combined the deliveries with 'doin the shuppin' for the more infirm householders in the town. Not surprisingly, she became a well known 'character' in the town. It had long been forgotten that she was the granddaughter of a Cornish hero. Emmie died of bronchopneumonia on 4th March 1981 at a residential home in Millbrook. Her favourite colour was white so she was buried in St. Stephens in a fine oak coffin lined with white satin and marked with a silver name-plate bearing the simple legend 'Emmie Odgers'. Her grave is marked with a plain white cross*. The author has now written a 'faux' autobiography of William Odgers VC which follows his life from a child in Falmouth, through working on a Cornish Lugger and East Coast Collier, to joining the Royal Navy and fighting in the Baltic, China and New Zealand. His life on his return to Saltash, and Jane Stoddon, is detailed, as is his work in the Coastguard and his final voyage on the 'Rodney' to the China Station as Admiral Keppel's Coxswain. The e-book link is https://skydrive.live.com/redir?resid=87BFF6A8F1E1FE91!247 . The format will allow viewing on the smaller devices such as Kindle and Kobo ereaders, but the maps included really require the larger screens of the I-Pad, notebook or laptop. 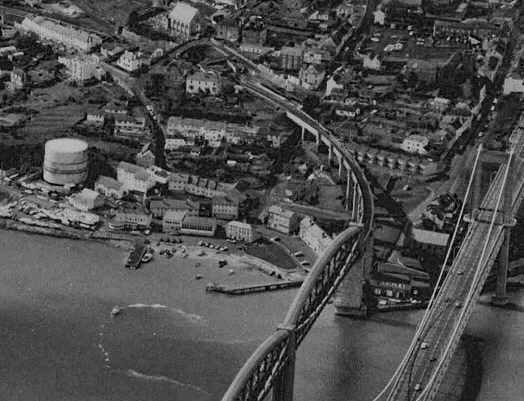 Saltash has been around for a thousand years or more, in one form or another. Early settlement near the beach itself, which now nestles below the Cornish end of Brunel's magnificent bridge, was inevitable; the sand and shingle here, maintained by the great Ashtor rock, was an ideal mud-free landing place. In the period of interest the town was largely defined by the activities in three streets: Fore St., Albert Rd. and Tamar St. These three streets formed an elongated 'U' with Tamar St. at its base. As its name suggests, Tamar St. ran parallel to the river, and it, with the immediate area around it, was referred to as the Waterside. This was the oldest part of the town and included (at least) three pubs, the Passage Inn (now the Boatman), the Wheatsheaf (now the Waterside), and the Union Inn, of which we shall hear more later. 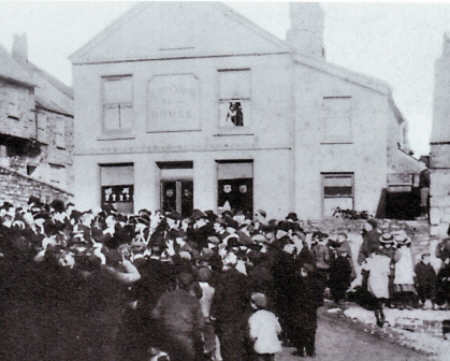 From time to time there was also an ale house at 13 Tamar Street, sometimes called the Tamar inn. 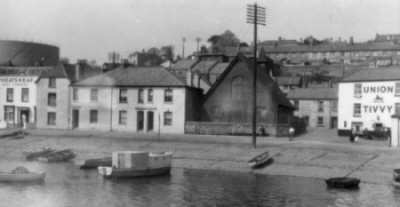 The first three pubs , the town quay, and Mary Newman's Cottage are still there today. The rest, including many 16th century houses, is gone, victim of the 'slum' clearance program of 1957-1966. It was to the Waterside that Drake, Hawkins and their associates brought their booty for safe storage in Trematon Castle prior to transport to London and the Tower. For me, the area retains a good deal of the history given it by these adventurers. Tamar St. itself is really the setting for this story. Up until WWII it was known as 'Pickle Cockle Alley' for the sale of shellfish from its shop fronts. At one time there were 21 of these retailers in the one street, and my great-grandma Adelaide was one*. Before starting on a description of our sailors' careers, it is useful to picture what life at sea was like, in general, in the mid-Victorian period. To begin with, it is easy to see why the Navy were keen to recruit young boys into the service. They could be as young as 12 or 13, were often orphans or motherless, and were soon adept at the tasks on deck or in the rigging. There is nothing like starting at an early age to develop the particular physique required for sailoring. Incidentally, these young boys were safe from violation; most of the crew disapproved of homosexuality, as did society, and the Navy punished any evidence of it with the ultimate severity, hanging. In fact, physical punishment for any misdemenour which affected the safety or smooth operation of the ship, including drunkeness, was severe and public. The introduction of Continuous Service Engagement (CSE) allowed the Navy to plan ahead for its envisioned crew requirements and to a certain extent to dispense with the need for impressment from the merchant service when war threatened. Starting at such a young age, the crew soon became highly skilled in their work. When trained they would sign up for 10 years service and often leave with a pension in their twenties to pursue an alternative life. At sea the essence of efficient sailing, fighting, and hygiene, was teamwork. The crew were divided into groups for watches, or messes for housekeeping activities like the preparation of food, cleaning dishes and cleaning 'heads'. The availability of food and its quality was much better than is commonly thought. In a week each sailor could expect 7lb biscuit, 7 gallons beer, 5lb beef, 3lb pork, 2lb pease, 4lb oats, 8oz butter and 12 oz cheese; they were therefore eating rather well compared to life ashore. The immediate surroundings of the ship solved the shore problem of human waste disposal, and that and the isolation from the general population for long periods greatly reduced the risk of disease. Scurvy was no longer a threat to the crew, once the efficacy of lemon juice and, later, lime juice was established. Only on certain duties was sickness a problem. The African squadrons, for example, who were often exposed to various fevers, gave the ship's surgeons something to investigate. As we shall be able to deduce from the various ships in which our sailors served over the period 1837-1865, the Royal Navy was then in a crucial state of flux with regard to what kind of ship to build; warship, frigate, sloop etc. What kind of propulsion to include; sail, screw, paddle or a combination, or, later, of what material to construct the vessel. In fact they frequently held trials with differing designs to try to determine the most effective ship in any given set of circumstances. Of course, the answer was complicated by the nature of the duty any ship was required to take. It was no use sending a wooden three-deck warship to intercept slave traders in the environs of the Zambesi, or to navigate the Canton river in the China wars. For this reason we shall describe the nature of the ship in which our sailors served so that the reader can determine for himself whether they suited the particular circumstance(s). One type of boat evolved during this period which was to have an enormous impact on the Royal Navy, and its enemies, throughout the second half of the 19th century. The early ones were much lighter than conventional paddle sloops, for example, at 200-300 tons. They were about 100 ft in length, with a beam of 20-25 ft, and screw propelled. They initially carried 2-3 68-pounder guns! The main requirement of the design was the ability to float in only 7' of water. None of our heroes served in one, but it was used with great success in the Crimea, the Baltic and the China second war. The name given to the first battles in the Taranaki Wars, those fought around New Plymouth itself, is generally the First Taranaki War 1860-1861. The antagonists were of course the Maori, native to New Zealand, and the, mostly British, settlers. The settlers of course formed armed volunteer forces and had the assistance of imported British troops and Navy. Naturally enough, the disputes which started off the series of battles were generally about land. Here we are really only concerned with two of the 'battles'; that at the 'L' Pah (Te Kohia) which wasn't really a battle but perhaps an attempt at extermination, and Waireka, where the men from the Niger were engaged at Kaipopo Pah. In order to make the details of the battles more readable, two maps and a drawing are given here. 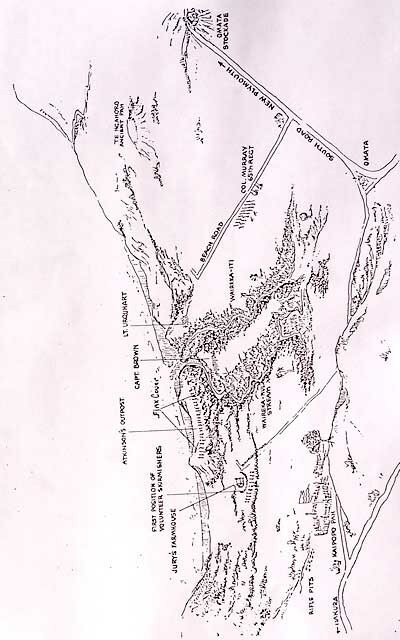 The first gives the locations of the battles near New Plymouth, the second a detailed sketch of the Waireka field of battle, and the drawing gives the perspective of the Kaipopo Pah relative to the river basin. These should be used with the text describing the movements of the various groups involved in the battle. Finally, it has to be said that there is inevitably controversy surrounding the outcomes of these battles. Was it a victory or a loss? Did these terms have the same meaning for the antagonists? How many died? Did the Maori run or was that a tactic etc etc. Surprisingly, I have found there to be little disagreement over the descriptions of the battles themselves. I have used as principal source Captain's Cracroft's Journal, written in 1862, because I happen to believe it to be a reliable account, and it generally fitted in with less detailed descriptions. Extreme views from either side have generally subsided with the years and it is important to remember that, here, we are telling a story about an ordinary hero, not a politician or Government appointee, but a man who was simply doing his duty. As a footnote, in its 1996 report to the Government on Taranaki land claims, the Waitangi Tribunal observed that the war was begun by the Government, which had been the aggressor and unlawful in its actions in launching an attack by its armed forces. An opinion sought by the tribunal from a senior constitutional lawyer stated that the Governor, Thomas Gore Brown and certain officers were liable for criminal and civil charges for their actions. It is also worth noting that Captain Cracroft's journal, published in 1862, is highly critical of Colonel Gold's (the British field Commander) handling of both the initial situation with the Maori and the subsequent movements of the British troops and the volunteers. 'MAORI WARS', from An Encyclopaedia of New Zealand, edited by A. H. McLintock, originally published in 1966. 1787 was the the year the popular movement against the British slave trade suddenly took off. Although there were no slaves in Britain itself, the vast majority of its people accepted slavery in the British West Indies as perfectly normal. At the end of the 18th century Britain dominated the trade, with more than a hundred slave ships leaving Liverpool, Bristol, and London each year as the slave-based economy of the West Indies thrived. How did the abolitionists turn this situation around? Well we can't answer that question here, but a read of the Hugh Thomas book 'The Slave Trade - The History of the Atlantic Trade' might help. We all know about the prominent campaigner William Wilberforce but who else was involved? Well the ordinary heroes were the Quakers; the first religious group to protest and the providers of most of the movement's PR and financial support. Miraculously, the Act was passed despite the many petitions against; from 1 May 1807, the trade was illegal. The penalties were also severe; £100 for each slave found on board and confiscation of the ship. Lord Grenville, the Prime Minister, believing that Britain was 'unrivalled on the ocean' was of the opinion that the trade could swiftly be brought to an end. British arrogance and aggressive pleasure in interfering in the commercial activity of other countries eventually led the way to abolition but it was an almost impossible task without the cooperation of the other nations involved in letting the British board their vessels. Service in the West Africa Squadron was full of risk and posed a constant threat to health from the many fevers available. The mortality rate was about five times that in home waters. There was a significant development when new treaties allowed that circumstantial evidence of slaving on ships, chains, cells, extra storage etc, was sufficient to prove the illegal trade. This vastly improved the British success rate and, in time, led other countries, even France, to allow their ships to be searched. However, total success in the Atlantic took nearly 60 years including 15 years of Isaac Stoddon's life. Commodore Jones to Captain Hamilton. "Penelope," Ascension, April 5, 1845. I HAVE the honour to report my arrival at this island on the 2nd instant, and to resume the account of the proceedings of this ship, subsequent to my letter to you of the 1st of March. I left the Gallinas station on the 2nd March, and proceeded in the first place to land several military officers for the garrison of Cape Coast Castle, where I arrived on the 6th, and on the following morning went on towards the Bight of Benin. Calling at Acra for information, I visited Whydah and Lagos, and successively fell in with the Cygnet and Star which vessels I completed with provisions. I had the satisfaction to find that the division under Commander Layton had recently had considerable success in the capture of slave vessels. On the 13th I arrived at Princes Island, and took in a supply of water, which is there very good, and 13 tons of coal, which occupied two days. I then proceeded to Fernando Po, where I anchored on the 16th, and speedily experienced the superior advantages of that place for coaling and watering, In three days we took in 300 tons of coal, and 90 tons of water. During my stay at Clarence Cove, I received much useful information from Captain Beacroft the Governor. I had the satisfaction to learn from him, that no Slave Trade had recently been carried on in the Bight of Biafra. 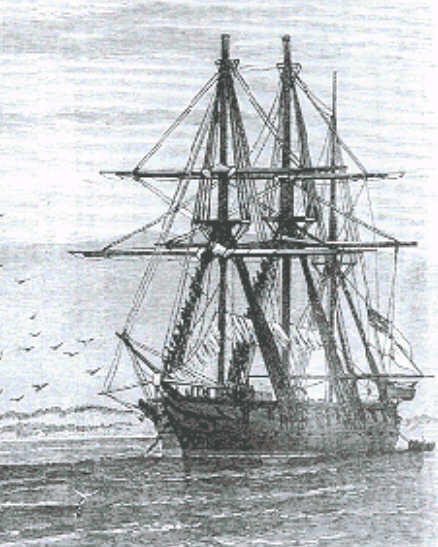 I left Fernando Po on the 19th, and rejoined the cruizers in the Bight of Benin on the 22nd and 23rd. I left the Cygnet, Star and Sealark completely supplied with provisions, and then proceeded to Acra for a supply of cattle for this island. Having on the 25th taken on board 20 head of oxen, I came away, and during my passage to this place fell in with the Ranger which I directed to come here, having reason to believe that I should want her assistance. But the Lily arrived here the same day that I did, (the 2nd instant,) and I was enabled to send away the Ranger on the same evening, with Mr. Gabriel, to Loanda. On the next day, the Lily was sent to the northward, in quest of Lieutenant Stupart, of the Wasp who had been sent to Sierra Leone in a prize, but whose presence I considered indispensable here as a witness in the case of the piracy and murder committed on a prize crew from the Wasp and which I will detail, as fully as I can, in a separate report. I can now venture to express my thankfulness that through Divine favour the operations in the rivers of Gallinas and Seabar, in the course of February, have had no ill effect on the health of the men employed in the boats. Every precaution was taken at the time, but the unavoidable exposure to pestilential air left me under much anxiety until the several weeks had elapsed during which the coast fever is said to be latent under similar circumstances. On my arrival here, I was gratified to find that the affairs of the island were, upon the whole, in a satisfactory state. The public works, under the skilful directions of Captain Frazer, had made a good progress; the catch of turtle had been this season uncommonly abundant, and the island had been well supplied with cattle. My only ground of concern was, as to the state of the water, which, for want of rain, has fallen below what I could consider a safe stock to rest upon; being, by this day's return 560 tons. We are in hopes of rain, but with last year's experience in mind, I consider it my duty to take prompt measures, during the momentary leisure which enables me to give my attention to this matter. Having other business at St. Helena, I have taken on board 100 tons of tanks, which I mean to fill at that island, and to bring back here; and I have taken on board 200 tons of casks in shakes, which I can leave in the commissariat store at St. Helens, and which can be readily set up any time, upon notice being given, and a vessel freighted to bring them on reasonable terms, under the direction of Mr. Gulliver, the Harbour Master, who I believe to be a good and honest officer. By this means, Government will not be exposed to such an infamous act of extortion as was attempted last year in the case of the schooner Eliza Scot. Their Lordships may rest assured, that I will exert myself to place that matter on a proper footing, and to do what is just and necessary, according to their directions. With that view I shall proceed to St. Helena to-morrow morning, and I expect to return here on the 22nd. By that time I hope to find the witness in the case of the Wasp's prize collected here, and ready to proceed to England in the Rapid which vessel I have sent the Lily to relieve, and to send here forthwith. Commodore, and Senior officer commanding. Richard Drake, Revelation of a Slave Smuggler, 1860. 'Last Tuesday the smallpox began to rage, and we hauled 60 corpses out of the hold.... The sights which I witness may I never look on such again. This is a dreadful trade...... I am growing sicker every day of this business of buying and selling human beings for beasts of burden... On the eighth day [out at sea] I took my round of the half deck, holding a camphor bag in my teeth; for the stench was hideous. The sick and dying were chained together. I saw pregnant women give birth to babies whilst chained to corpses, which our drunken overseers had not removed. The blacks were literally jammed between decks as if in a coffin; and a coffin that dreadful hold became to nearly one half of our cargo before we reached Bahia [in Brazil]. The Gallinas river enters the Atlantic in latitude about 7 1/2 °, between Grand Cape Mount and Cape St. Ann, near one hundred miles northwest of Cape Messurado or Monrovia. The name of the river is given to the cluster of slave factories near its mouth. This place possesses no peculiar advantages for any species of commerce, and derives its importance, exclusively, from the establishment of the slave factories there. The land in the vicinity is very low and marshy,the river winds sluggishly through an alluvion of Mangrove marsh, forming innumerable small islands. The bar at its mouth is one of the most dangerous on the coast, being impassable at times in the rainy season. It is located in what is termed the Vey Country, the people of which, are distinguished for their cleanliness, intelligence, and enterprize in trade. How long Gallinas has maintained its importance as a slave mart, we are unable to say, but at the time of our first visit to Liberia in 1831, its reputation was very extended and its influences most deeply felt in the colony. It was estimated that near 10000 slaves were, about that period, annually shipped from this place alone. The business was done, mainly, through the agency of several merchants or factors established there, the principal of which, was Pedro Blanco, a Spaniard. This man's influence was unbounded among the native tribes on that section of the coast, and we fear, at one time extended to members of the colony of considerable respectability. He was a man of education, having the bearing and address of a Spanish Grandee or Don, which was his usual appellation. He lived in a semi-barbarous manner, at once, as a private gentleman and an African prince. He had at one tine a sister residing with him. He maintained several establishments, one on an island near the river's mouth which was his place of business or of trade with foreign vessels, that came to Gallinas to dispose of merchandise; on another island, more remote was his dwelling-house,where he kept his private office, his books, dined, took his siesta, slept, &c.; here, we believe, his sister also resided. On a third, was his seraglio of native wives, each in their several dwellings, after the manner of native chiefs. Independent of all these were his barracoons of slaves, of greater or less extent, as circumstances required. It may readily be supposed that with the wealth accruing from a long and successful prosecution of the slave trade, his power among the natives was equal to that of any despot; and the following incident related to us by one his partners proves that he occasionally exercised it. Having occasion one day to travel on the sea beach some distance from Gallinas, near the island of Sherbro, where he was unknown, he approached the hut of a native with a view of taking rest and refreshment. He asked the owner of the house, who was squatted in the door, to hand him fire to light his cigar. The man bluntly refused, upon which, Blanco drew back, took a carbine from one of his attendants and shot him dead upon the spot. The advices from Africa, published in our last number, contain the gratifying and important intelligence, that, the long blockade of Gallinas by the British cruisers, has induced the slavers at that place to break up their barracoons, deliver up their slaves to the commodore and to take passage for themselves and effects on board Her Majesty's vessels for Sierra Leone. This is the initiative step to the entire abolition of that traffic on the windward coast; the next, and not less important, is, the purchase of the territory by the Government of Liberia. That the slaves are given up, the barracoons destroyed, the slavers themselves removed and every vestige of this accursed traffic obliterated, avails nothing, unless proper and sure measures are taken to prevent a re-establishment of the business, the moment the coast guard is abandoned; and we doubt not, from the tenor of the advices above referred to, that ere this, either by purchase or conquest, Gallinas and its dependencies are a part and parcel of the commonwealth of Liberia—this measure, only, will ensure it against a reenactment of the scenes of distress and horror which have heretofore rendered that place so infamous. 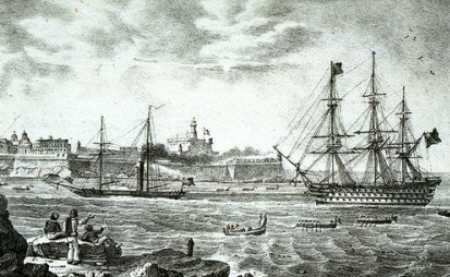 landing supplies and troops, landing sailors and marines (blue jackets) to assist the army, principally with gunnery, and in taking off wounded, particularly after the battle of Alma. For the latter, the British Naval Commander, Admiral Dundas, detached his whole fleet, nearly all his surgeons, and 600 seamen and Royal Marines. The one thing the Navy was not able to do was to directly confront the Russian Navy at sea. They were safely moored in Sebastopol harbour. The one opportunity the Navy had was directly after the Alma Battle, but the allied commanders were afraid to detach the fleet from the land forces, and soon after the Russians sank seven ships across the harbour mouth rendering entry or exit impossible. In doing this the Russians also felt able to release large numbers of guns and gunners for their land forts. At least Dundas now could feel entirely confident that the Russian fleet was now out of the action, so he concentrated the Navy's efforts in the formation of a Naval brigade to serve ashore in the batteries. It was directed that each large ship should contribute 200 officers and men, and a contingent of lower-deck or other principal guns; and that the other war vessels should contribute in proportion. Each ship of the line sent ashore all her Marines, except a few who remained for sentry-duty, and all her best seamen-gunners, together with deck-awnings, spare canvas, spars, and half her ammunition. In all, 2400 seamen, 2000 Royal Marines, and 50 shipwrights, with 65 officers, and about 140 guns, were landed. On October 15th Dundas met with the other allied Naval commanders to respond to the "urgent request" of the allied land commanders for the co-operation of the fleets in the opening bombardment of Sebastopol. Dundas was unwilling to give this co-operation. He would gladly enough have met a hostile fleet; but he was strongly of opinion that it was not the business of wooden walls to pit themselves against stone ones. 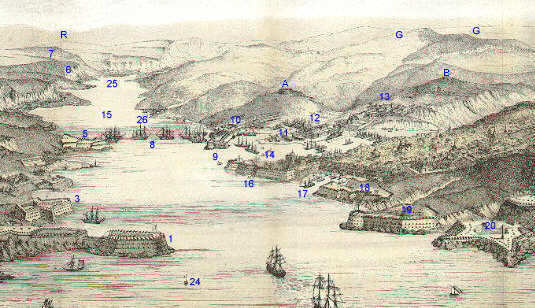 Shown here is a drawing* of the Sebastopol harbour with its many forts, and a detailed image of what appears to be Fort Alexander observed from the Quarantine Fort, as an example of the strength of these defences. Dundas, mindful of his loss of guns and gunners and aware of the strength of the fortifications, could only at last be persuaded by his fellow commanders. The disposition of the ships, which had to be lashed to a steamer to manoevre into their 'sitting duck' position, is shown here*. All that remains to reproduce Admiral Dundas's report to the admiralty on the results of the bombardment*, and to include here the comments of a correspondent present at the bombardment. cannot, of course, as yet be correctly ascertained. principally by shell and hot shot. 11 Low water. Ship healing 4½ ° to port. Water round the ship not less than 4 fms. 2:15 Ship went off into deep water. Slipped stbd, bow hawser - and left them behind, 9 in[ch] hawser, 1 in no., 11 inch, 1 in no. My Grandmother, Elizabeth Craven's Headstone in St. Stephen's. John Dunsford Craven was my Grandfather, the oldest child of Adelaide and the oldest Grandchild of William Odgers. His other Grandfather was John Craven the friend of William Odgers and father of John Broadbent Craven. John Craven drowned off Dungeness in 1894 in the great November storm of that year. With such Grandfathers he could not escape the sea. He became a Master Mariner at age 21, became a Master of the War Department fleet in 1910, and received the British Medal and Mercantile medals in WWI for service in dangerous waters. Amazingly (to me at any rate) he also was awarded the WWII Star and War Medals for service during the evacuation of Dunkirk when he was 66 years old. He died when I was 19 years old and I never knew about any of this. This is why his photos taken at the outbreak of WWI, and two years before Dunkirk, are here.